How do you create something that’s familiar and relatable, but has never been seen before? That was the task director Pete Docter set out to accomplish with his next Pixar movie, Inside Out. After directing Monsters Inc. and Up for the animation giant, he pitched three story ideas to John Lasseter. While none of them were officially green lit at the time, he came back a couple weeks later with a new idea, to take audiences on a journey inside a young girl’s head to meet the emotions influencing her life. That was about five-and-a-half years ago, and Inside Out looks like it’ll be another hit for Pixar after it premieres this June 19. We were on hand at Pixar headquarters in Emeryville, California to get the inside story on Inside Out from Docter, producer Jonas Rivera and their animation team. As an added bonus, press were treated to a screening of just under an hour’s worth of the film. 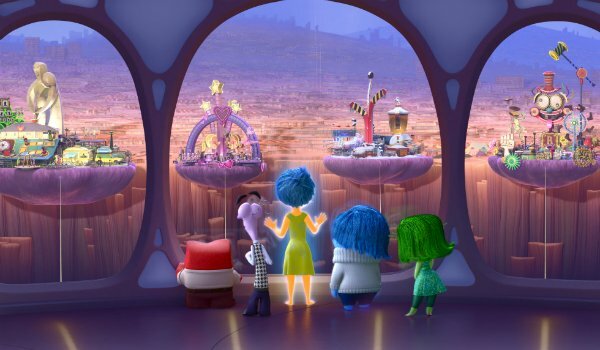 So far the public has only seen what’s been offered by the trailers, begging the question, does Inside Out have what it takes to further the studio’s legacy and accomplish Docter’s mission? Trust us, it has all the ingredients to be the next big hit. We are going to get a little spoilery here, so only read if you want to find out more about Inside Out! Inside Out follows the life of Riley, a spunky and positive young girl loving her life, friend and family in Minnesota. When her dad gets a new job in San Francisco, Riley has to adjust to a new life with her parents in a cramped and dreary new home. But Riley isn’t the protagonist of this story. She’s the setting. We experience all of her ups and downs from the perspective of the emotions living inside her mind. There’s Joy (Amy Poehler), who is perpetually optimistic. Joy feels a special bond with Riley, as she was the first emotion to form in the girl’s mind. Although, this leads her to manhandle the other emotions into taking a backseat. There’s also Disgust (Mindy Kaling), who’s all about making sure Riley doesn’t embarrass herself with poor style choices or eating green vegetables. Anger (Lewis Black) is great for throwing tantrums, and the paranoid Fear (Bill Hader) is there to protect Riley from any and all threats. Finally, there’s Sadness (Phyllis Smith), whose purpose isn’t quite clear to Joy. Together, they steer the ship that is Riley’s mind and care for all of her memories. There are two kinds of memories. The standard appears as a glowing orb and its color depends on the emotion surrounding it. (E.g. yellow denotes a happy memory, blue a sad memory, etc.) Core memories are brighter and more important; they power the "Islands of Personality," which are floating plots that embody one of the individual's primary personality traits and values. So far, it’s been smooth sailing, but everything changes after the big move to San Francisco. Sadness develops an uncontrollable desire to touch Riley’s happy memories. Doing so, however, causes them to change from gold to blue. As Riley is introducing herself to her new classmates, Sadness gets a bit too touching with a memory, which leads to Riley producing a sad core memory. Joy scrambles to forcibly fix everything, but the ensuing scuffle causes her and Sadness to get sucked out of a tube and thrown into the wilderness of Riley’s mind — along with the other core memories. Without them, there’s nothing to power the Islands of Personality. One by one, they start falling down the pit where everything forgotten lands. Worse still, Disgust, Anger and Fear are the only ones left to influence Riley. Inside Out then becomes a race against time. Joy and Sadness must get back to headquarters before the last Island falls, a journey that takes them through the maze of "Longterm Memory," a visit to "Imaginationland" and "Dream Studios," and a trip on the "Train of Thought." The biggest surprise of Inside Out, and what makes me think Pixar has another massive success on their hands, is how accessible the emotions are as characters. They are, in fact, so well-rounded that they prove to be more human than the humans they inhabit. Pete Docter stressed the importance of making the emotions experience an array of emotions themselves, and he succeeded with the film’s clever dialogue and complimenting animation. The dinner scene, which sees her parents trying to talk with their skulking daughter over a meal, has been featured prominently in the trailers, and it's a prime example of what audiences can expect from the characters and tone. This interaction between the more mature emotions inside mom and dad's heads and Riley's instantly doubles the film's potential audience; adults can relate to the nonesical nature of parenting, while kids will laugh at Anger blowing a gasket. We've all had these experiences at one point or another, and I quickly found the clever and lighthearted way Docter approaches these familiar moments to be endearing. If it's not the dad day-dreaming about hockey, you'll laugh over the perfect boyfriend machine in Imaginationland or the Hollywood studios-esque Dream Productions or the workers coming in to toss out all the dwindling memories. The cast is also eerily perfect. Even before actors began auditioning, Docter joked about the possibility of having Black playing Anger. The others weren't as clear at the time, but Hader also coincidentally came to visit Pixar headquarters to express his interest in getting involved with a future film. He proved to be a master at Fear; his voice performance is just as animated as his paranoid and strung-out character. Poehler, Kaling and Smith all eventually fell into place, too. Poehler is already a ball of sunshine, while Kaling and Smith dust off their hilarious quips from their days on The Office. We'll have more coverage of Inside Out down the road, but be prepared for the most unexpected delight of the year.